"I did some mystery shopping of my own at retail stores around Manhattan, inquiring about various WP7 devices." Now this is an interesting story. Sara Yin at pcmag.com did a little Windows Phone 7 retail survey of her own. She simply walked into retail outlets for AT&T, T-Mobile, Verizon, and Sprint and inquired about purchasing a Windows Phone 7 device. The responses varied, but by and large the people she talked to were not very knowledgeable about the platform, there were few Windows Phone 7 devices to try out, and she was even directed away from the platform. This is clearly a very small sample size, but a niggling feeling I have makes me think this kind of experience might not be that uncommon. Clearly, though, Microsoft is partly to blame. So, if this is indeed a fairly common happening, what should, or could, Microsoft due to avoid potential customers having the same experience? Have you had this experience? I'm on Sprint, and the only store in my area that has a working display is the Corporate store. All of the other stores around here are privately owned and they said they were not supplied with sample phones for the displays. I have had the same experience when visiting BestBuy, Sprint stores, Radio Shack, etc. I had the same experience when I was with my girlfriend when she was shopping for a new phone. Basically we were just wandering around the phone shops looking at Android and WP7 phones because she wanted to see how big they were in person and just get a feel for what they were like. Whenever we were approached by an attendant in the store (about 3 times) we got turned away from WP7. Can't remember what exactly they said but I remember knowing a significant amount of it wasn't even correct. I think one of them said that WP7 is only for more technical people (probably exactly the opposite to what's true)..
Microsoft should have dropped the 'Windows' branding, it was tainted with 'Windows Mobile'. We need a hidden video street team. My wife was in the market for a new phone. At the local AT&T store, she went to go look at the Samsung Fascinate she has been researching first. The salesman tried to point out it only has 10k apps compared to the hundreds of thousands for other OS's. She mentioned she would only use a few. He then tried to sway her to an Moto Atrix due to its powerful dual core, she mentioned she just wanted something easy to use since she is not a power user. He then tried to sell her on waiting for the new iPhone 5 to be released in June (this was two months ago). I could not help but the chime in that there have been no announcements of any new iPhone this year and there are only rumors. He highly recommended not getting the Windows Phone 7 but had no legit reasons aside from a smaller catalog of apps. We ended up getting her Fascinate and she has been very happy with it ever since, I also walked out with an HTC Surround which is one of the best phones I have ever had (coming from a Samsung Captivate with an iPhone 3gs before that). I could not help but get annoyed by salesman trying to push their own personal preferences on the users as opposed to matching them to a device which best suites their needs (ease of use for my wife and Zune/Games for me). I had similar experience in AT&T store in Manhattan. I asked for Windows Phone device, Sales person asked me why do I want Windows. I said I use hotmail, office a lot, this young man tried to sell me Blackberry! Microsoft has a great deal running for the next week. 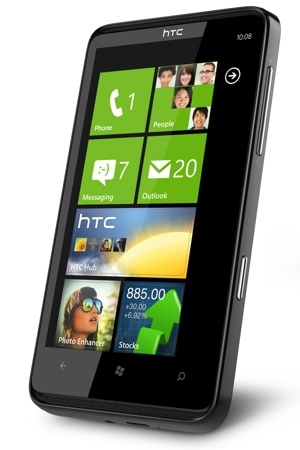 At the Microsoft Store (online too) you can purchase a new HTC Windows Phone for only 1 cent. They have choices from Verizon, T-Mobile and Sprint. My wife and I just upgraded to the HTC Arrive from Sprint. It's much worse here in Canada. Almost no working devices and I've had sales reps tell me they would not sell me a Windows phone on principle. Maybe a secret shopper video would be a good idea. No one really gave any reasons for salespeople dissing WP7 but I'm sure unfamiliarity, negative press, very bad experiences with previous Microsoft products, the update fiasco, and the fact it won't even be close to being competitive until Mango (and even then it won't quite match iPhone and Android) have a lot to do with it. 2. Wait for Mango. Until then it's a lost cause. 3. Get phones to Virgin, Metropcs, etc. People will soon realize that $100+/month is way too much for phone service. You can get a decent Android for $25/month and $50 for unlimited everything. Sticking with postpaid is a sure way to oblivion. Only Apple and Blackberry can get that kind of $$$ from people. Blackberry because most of their customers don't pay for their phones and APple because, well Apple is the only brand with the cache to demand premium prices. Just IMO.